On Tuesday 7th June, one of PF Olsen’s contractors, Ian Tarei from Omataroa Kaitiaki Ltd, attended the annual Green Ribbon Awards ceremony at a Parliamentary function in Wellington. Ian carries out pest control and kiwi survey work for PF Olsen, but his primary passion is his kiwi population, located in Puhikoko Reserve, near Whakatane. Ian manages the Omataroa Kiwi Project which controls pests and predators on nearly 7,800 hectares of native and exotic forest, increasing survival rates for kiwi and other native species. 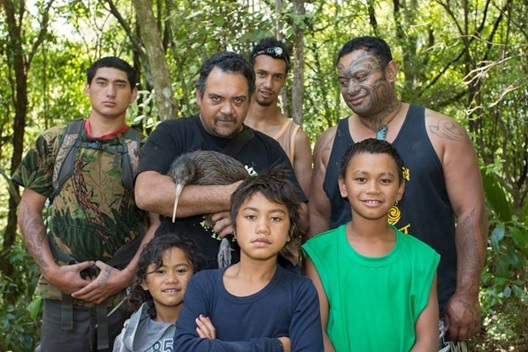 It’s been Ian’s tenacity and drive that have kept the project going in the face of early funding problems, and he now mentors other iwi conservation projects to share the kaupapa and encourage others. The Green Ribbon Awards recognise exceptional environmental achievements by organisations and individuals around New Zealand. Ian was nominated for the Kaitiaki leadership category of the awards by Bridget Palmer (DOC Whakatane) and Kiwis for Kiwi for his “tenacity and leadership, to achieve strong outcomes for the environment and for his people”. Addressing the declining population of not only kiwi, but also kereru and North Island robins, the environmental benefits of the Omataroa Kiwi Project have been significant with kiwi survival rates up over 50 percent. Established in a resource-stricken area with minimal support, it has been the passion of this small group of individuals that has driven the project over many years. The team also has an educational focus, working with schools, teaching pest control and passing on matauranga Māori, and training local people to undertake the work in the longer term. PF Olsen think this is an amazing and well-deserved award for Ian and his team. Congratulations!